On our arrival at the train station in Chiang Mai, we were to no surprise immediately approached by several tuk tuk and taxi drivers. As obvious tourists, the price we were quoted for a short ride to the hotel was exorbitantly inflated. Don’t be afraid to bargain and/or walk away. Taxis and tuk tuks are easy to find. In Chiang Mai, there are songthaews, also known as red trucks. For about 30-50 bhat per person depending on the distance you can catch a ride just about anywhere in the city. Tuk tuks tend to be a bit more expensive but you can always try to haggle your price down. After a bit of bargaining we came to agree on a reasonable price for a red truck to lie hotel. During the ride, we spoke with an Australian ex-pat who recommended we check out Nimmanheminda road. 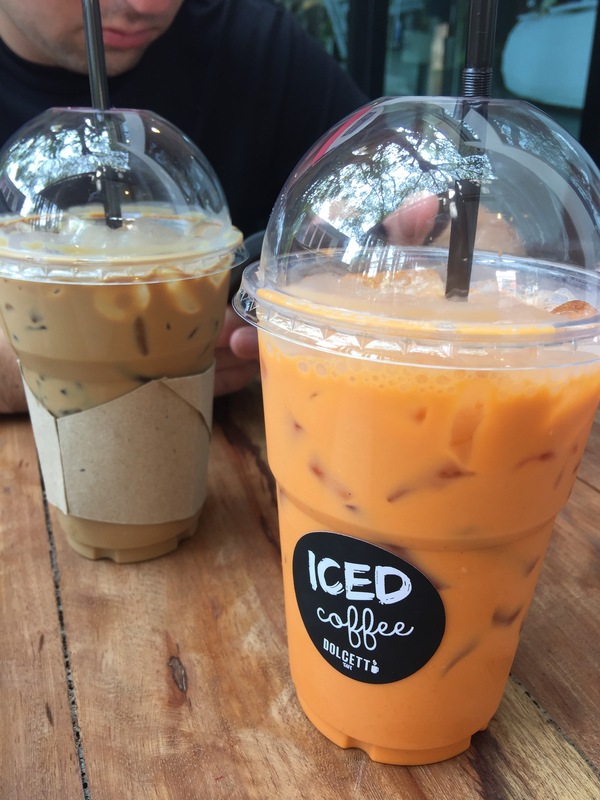 We dropped off our bags and caught another red truck to Nimmanheminda and found ourselves drinking Thai milk tea at the Dulcetto cafe. While there we spoke with a man from Toronto, who had moved to Chiang Mai two years ago to teach. 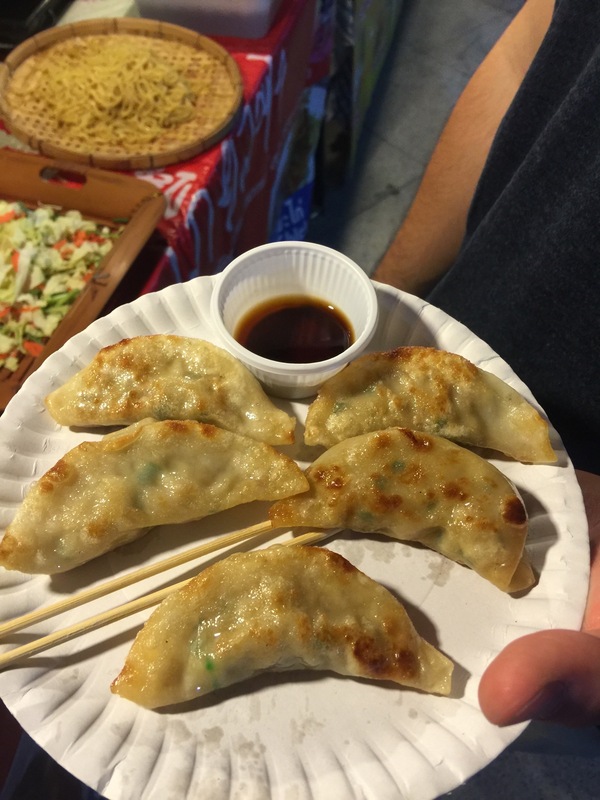 He gave us a few suggestions for food, and what to do during our time in Chiang Mai. 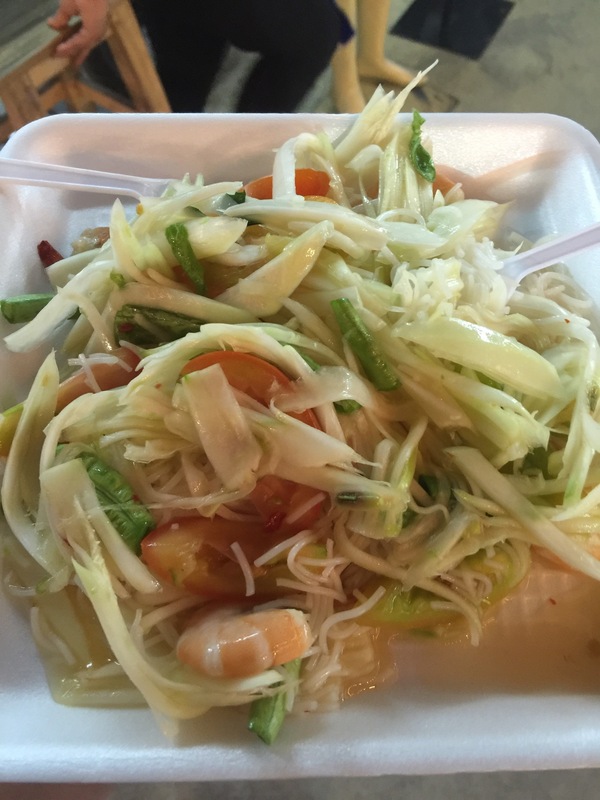 After finishing our tea, we went to TongTemToh for a bit of northern Thai cuisine. We stared with the northern Thai hors d’oeuvres followed by two orders of sticky rice, and a steamed coconut chicken dish. In true Jess and Steven fashion, we obviously couldn’t finish it all. The bill came to a whopping 320 bhat or $9.11 including bottled waters. 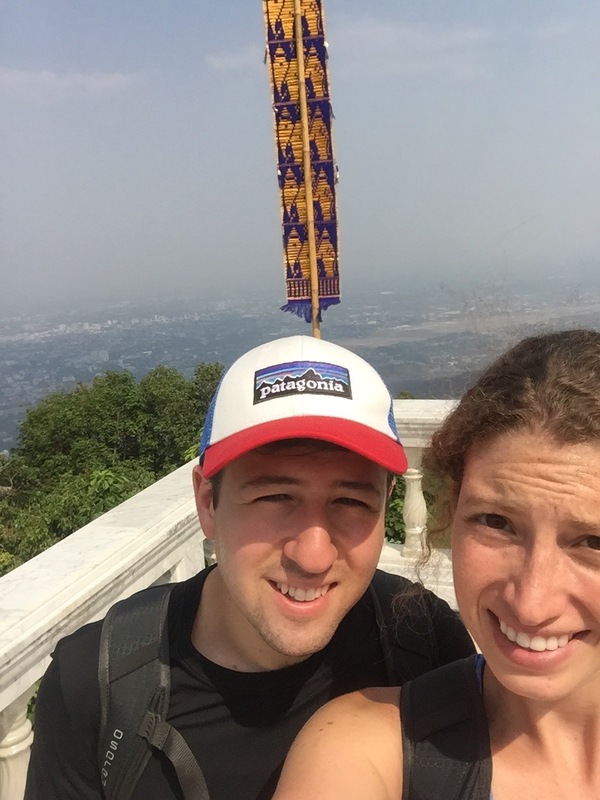 Following our meal, we hopped in a red truck and asked to go to the bottom of the mountain, where we then switched to a different red truck to go to Wat Phra That Doi Suthep. According to legend, a monk found a piece of bone after dream that he should look for a relic in the jungle. It is said that the bone is the shoulder bone of the Buddha. When the bone broke in two, one piece was enshrined and the other placed on the back of a white elephant. The elephant was then released into the jungle. 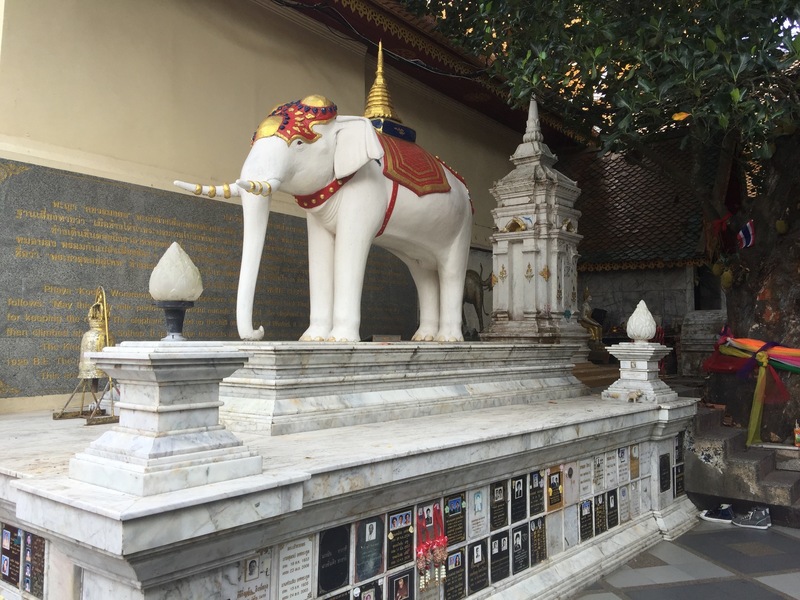 It then climbed up Doi Suthep mountain, trumpeted three times, and then died. This was seen as an omen and a temple was immediately ordered built in that spot by the king. When we arrived at the car park, we looked up to see 309 stairs that we had to conquer to reach the temple. (There is a tram to the top for those who are less apt to physical activity). From the temple you have a cool view of the city. It’s definitely a cool place to visit, and the stairs up to the temple, with dragons on each side, were quite the impressive sight. Next we went back into town to plan the following day with the elephants, freshen up and figure out what to do for dinner. The reception staff at the hotel recommended we check out an area they pointed out on the map, but we couldn’t seem to find much in that general area. As such, we opted for a more immersive experience and caught a tuk tuk to the Chiang Mai University area, located on Suthep Road where we soon realized we were the only tourists in sight. If your after inexpensive but fresh and delicious local cuisine this is the place to be. 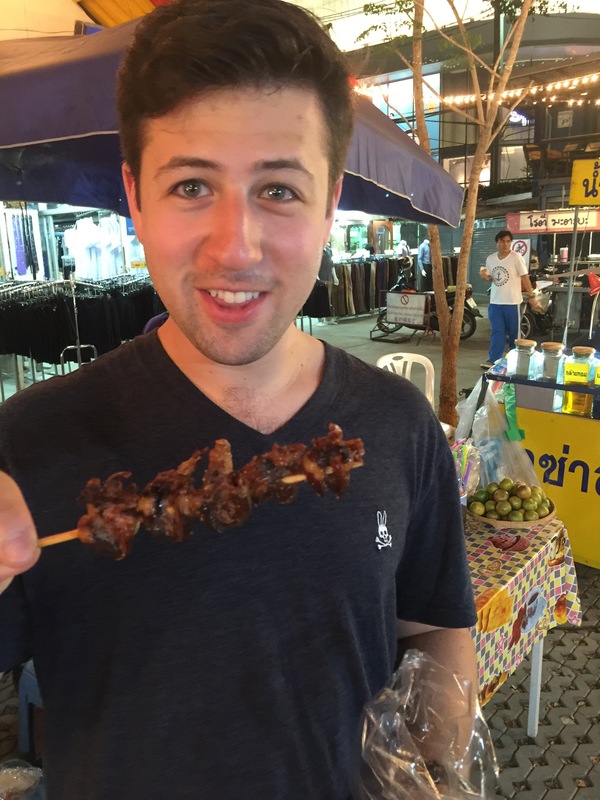 We spent about $5.00 between the two of us, devouring spicy papaya salad, grilled chicken skewers, grilled chicken hearts, fried octopus, and pork dumplings. 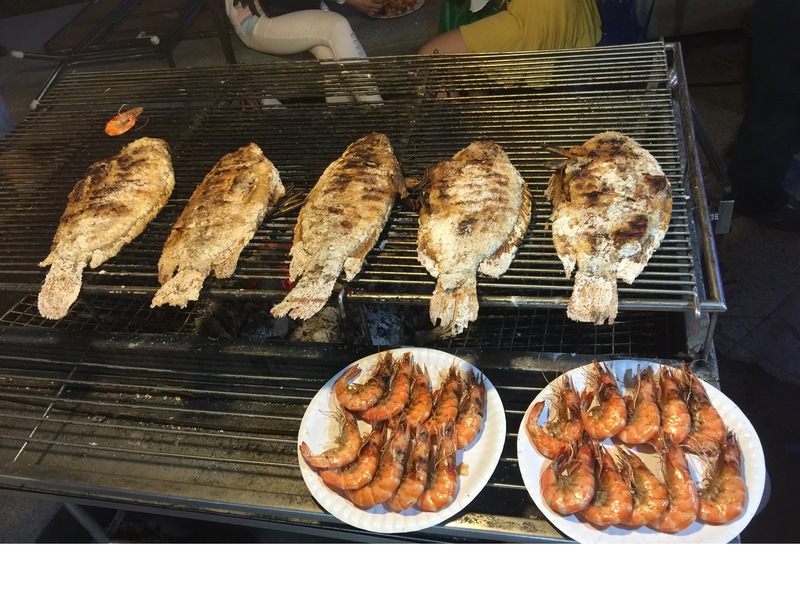 We also found salted grilled fish and grilled prawns, which both looked delicious. However by the time we found them we were stuffed! We then walked down Nimmanheminda road, where the night life in Chiang Mai is centered around a few bars. There’s even a self service beer, wine, and liquor store with outdoor seating which seemed to attract the Chiang Mai University crowds. 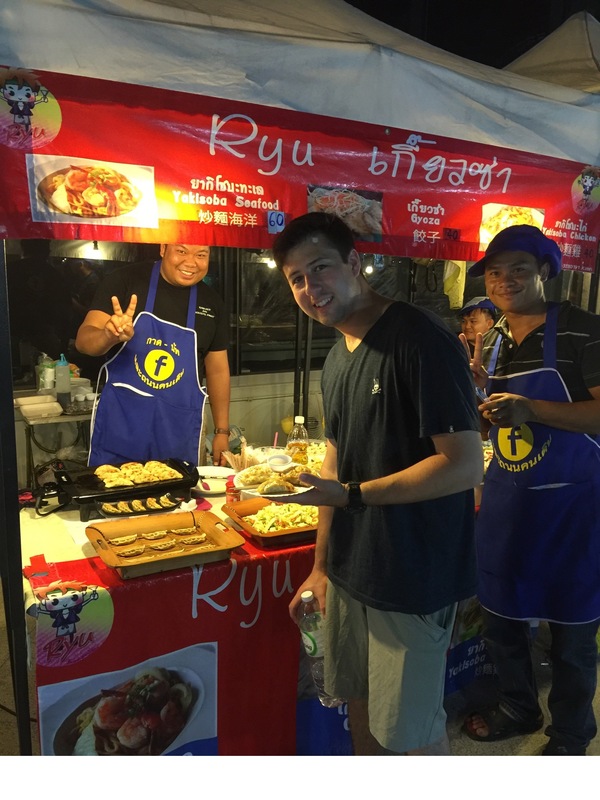 Another great place for street food in Chiang Mai, so we have heard, are the South Gate and North Gate areas of Chiang Mai. We haven’t had the chance to check those areas out yet, but stay tuned as well be back in Chiang Mai in a couple of days.